Samsung Galaxy Grand, which was announced in December 2012, has now received its official announcement in India. The 5" smartphone with dual-SIM functionality has been priced at Rs. 21500 (about $400). 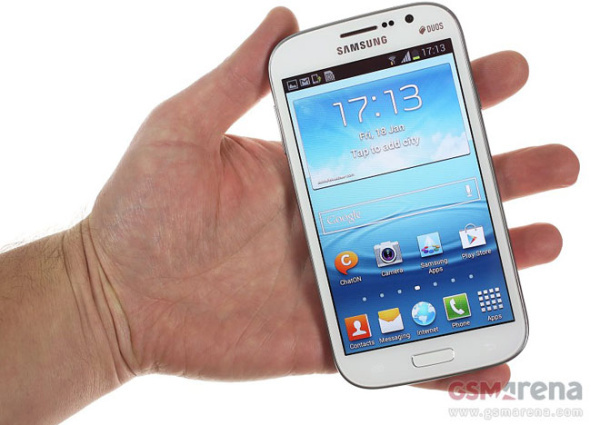 Samsung Galaxy Grand features a 5" WVGA TFT display and runs on Android 4.1 Jelly Bean. The smartphone is powered by a 1.2 GHz dual core processor along with 1 GB of RAM. The smartphone has an 8 MP camera with LED flash at the back and a 2 MP shooter in the front. The dual-SIM smartphone offers 8GB of storage and supports memory expansion up to 64GB via the microSD card slot. Samsung Galaxy Grand runs on a 2100mAH battery and comes with few cool home-backed features like S Voice, Direct call, Smart alert, Popup play along with the Multi-View functionality, which allows the users to access two apps simultaneously. Furthermore, the handset's auto forwarding option will automatically divert incoming calls on the other SIM to the primary SIM, if when you are in a call. We have already got our hands dirty with Galaxy Grand - you can check out what we learned about it in our hands-on.